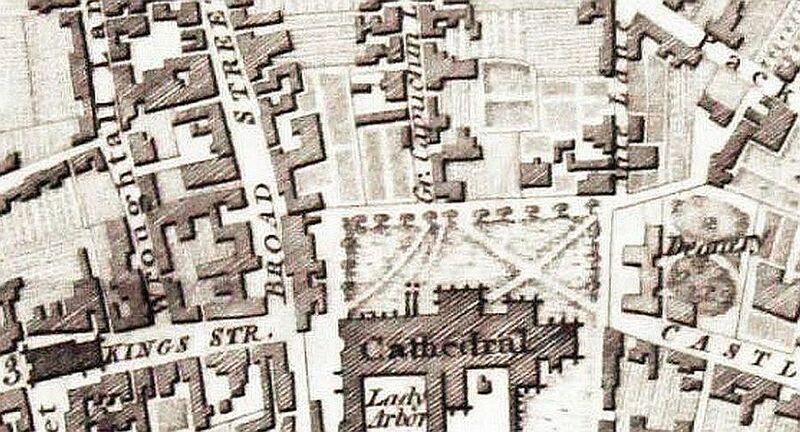 In the fifteenth century the two parts were separately identified as Brode Cabeige Lane and Narowe Cabeige Lane, which was gentrified in the eighteenth century to Capuchin Lane. The nineteenth century saw it become Church Street with the narrow section being called, rather confusingly as it was furthest from the river, Lower Church Street. Church Street was in St. John’s Parish, where parish officials in the post reformation period applied the laws of settlement to exclude the lame, lazy and sick, thus providing for a ‘polite society’ and maintaining the area’s wealth. However, this did not stop a number of public houses and subterranean drinking dens flourishing in the area. There were three in Narrow Cabbage Lane alone. The first Herefordshire Directory, published in of 1835, lists 26 distinct trades and specialists such as a butcher, baker, fishmonger, tailor, bookseller and milliner. Church Street was seen as a street of commerce and refinement – a position it still holds today.